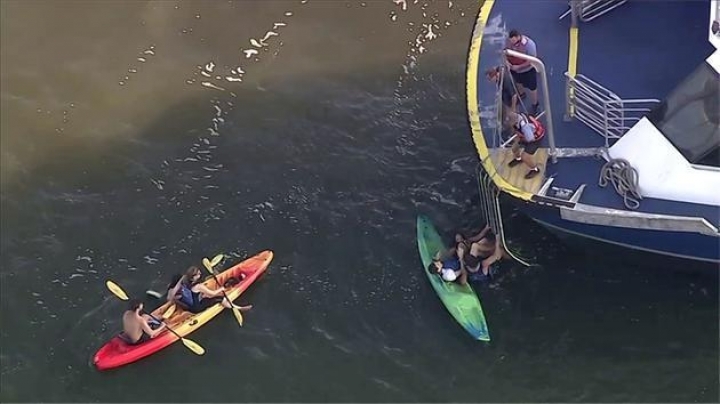 NEW YORK — Authorities are looking into whether sun glare was a factor in an accident in which a ferry departing a pier slammed into a group of kayakers, critically injuring one and knocking some into the Hudson River. 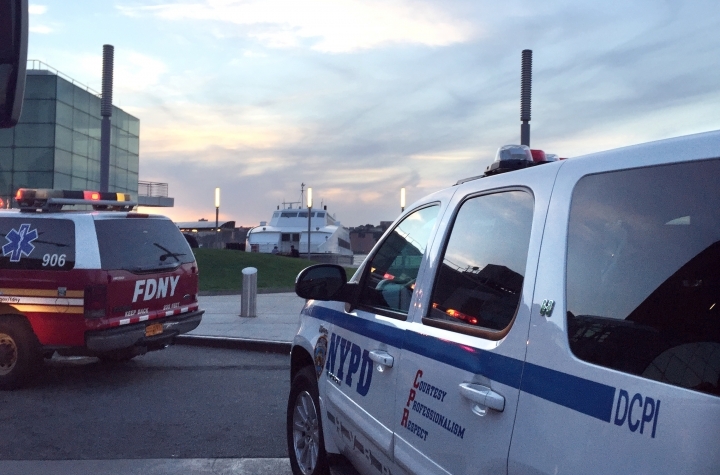 Ten people in eight kayaks were paddling down the river on Tuesday evening on a sunset excursion when they were struck by a NY Waterway ferry, New York Police Department Inspector David Driscoll said. Five people were hurt. An employee of the Manhattan Kayak Co. suffered the most serious injury; his arm was partially severed. "He had lost a lot of blood, and he was lapsing in and out of consciousness," Driscoll said. Authorities credited quick action by police Officer Tommy Le with possibly saving the man's life. "He was lying on top of the kayak, and there was a pool of blood," said Le, who applied a tourniquet to stop the bleeding. The man was hospitalized in stable condition. Authorities don't know what caused the crash but said they were investigating whether sun glare played a role. "When you're driving the same thing happens," Driscoll said. "When that sun is low in the sky you get a glare condition, and where you get blinded on the road sometimes the same conditions could exist on the water." Authorities also were looking into what navigation rules applied. "There are rules of the road. However, how they're going to be applied in this instance will eventually be determined by the Coast Guard and the PD investigation," Driscoll said. The ferry captain tested negative for drugs and alcohol, authorities said. A spokesman for NY Waterway said it was cooperating with police and the Coast Guard. The private ferry line transports passengers to various locations, many along the Hudson River in New York and New Jersey. A message left with the Manhattan Kayak Co. was not immediately returned. This story has been corrected to show the accident was Tuesday, not Thursday.